Dean Ainslie discusses his goals for Simon and introduces the main focus of what will become the School’s strategic plan. The University of Rochester’s motto is Meliora, which means “Ever better.” That sentiment motivates our intention to make the ranking of Simon Business School the focus of our efforts over the next five years. Everyone in the Simon community knows we offer an excellent product. Our students are outstanding, our faculty is exceptional, but, for a variety of reasons, the marketplace has not always agreed. We need to fix those errant perceptions and let the market know that Simon is among the very best business schools in the country. Understanding my vision for Simon’s future requires that we all agree on what I believe to be a fundamental truth: The ranking of a business school determines its ability to hire and retain top faculty, attract quality students, and connect with the best recruiters. By strategically improving our rankings, we create more opportunities for the School, improve our academic reputation, and place ourselves on sound financial ground for the future. With that in mind, my vision for Simon is twofold. In five years, I want it to be ranked in the Top 25 business schools and draw less than five percent from our endowment. You can think of limiting our draw as either a goal or constraint, but either way you look at it, we must be vigilant in the process of improving our rankings while maintaining the financial security of the School. These are aggressive goals, but they are not out of reach. We already have many of the key elements we need to be ranked in the Top 25. Our strong research culture, the quality of our admissions, and our career placement numbers already put us in contention. What it will take now is a focused effort by our faculty, administration, staff, and alumni to improve our student satisfaction rates and the perceptions recruiters and other business schools have of our School. That is not to say we haven’t been working on this already. In the past year, associate dean David Tilson spent countless hours interviewing and surveying our outgoing students to determine how we can improve the Simon experience. We learned that some of the least satisfied students were those in the 18-month program, and after carefully analyzing all the survey results, we discontinued that program and deepened our resolve to do everything in our capacity to improve student outcomes. Most important, we won’t be waiting until the end of the strategic planning process to introduce innovations that help improve student success. In the coming weeks, as we create our own solutions and develop Simon’s plan to reach the Top 25, we will focus on the areas where our efforts will achieve the highest marginal gain. The strategic planning committees will help continue our improvement by collecting critical data and benchmarking the relevant measures of our School. 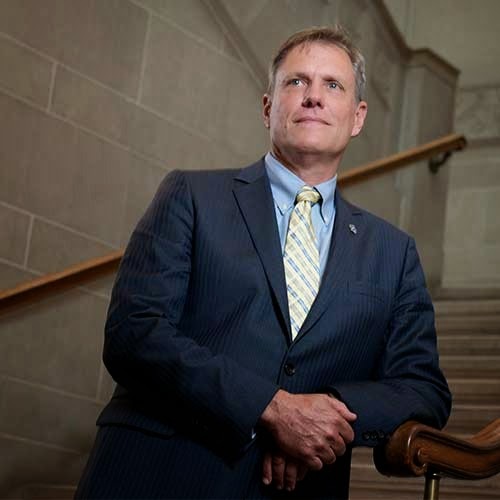 Once those ad hoc committees have made their recommendations, a high-level Dean’s Advisory Committee will craft the five-year strategic plan. To improve our rankings, we must let the world know about the extraordinary business education happening at Simon and what that means for our talented network of alumni who are excelling in their careers and changing the world. We feature several of them in this issue, including a fascinating look at graduates who are taking the business skills they learned at Simon and applying them to create sustainable solutions through social entrepreneurship. That same spirit of innovation can also be found in our special feature about the power of disruptive innovations. As you will read, more and more of our graduates are pursuing successful careers in high-tech industries, and are learning that change is the new norm. Thankfully, their professors at Simon were just the right people to prepare them for it. To make change happen, we need help from our accomplished alumni network. 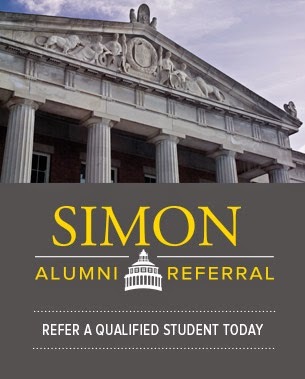 When you help students, hire graduates, make donations, and share your ideas, you contribute to Simon’s success. We thank you for all you do and hope you join us.